Norway’s masters of black sonic evil, 1349, are finally delivering their plague ridden offerings across New Zealand soil. Founded in Norway in 1997, 1349 have remained a constant influence on the Norwegian black metal scene. With a penchant for lightning speed riffing, blazing drums, and apocalyptic lyrics, the band has trail-blazed the underground, surpassing many of their peers through brute musical force. Countless US tours with dark luminaries such as Carcass, Cannibal Corpse, Celtic Frost, Suffocation and Behemoth, this will be 1349’s first time ravaging our shores, finally unleashing their sermons of Chaos upon New Zealand Masses. Blending raw melody, dark, bloody atmosphere and aggressive low-fi production, the first three albums, Liberation (2003), Beyond the Apocalypse (2004), Hellfire (2005) were a benchmark of high tempo blast beats, frenetic tremolo riffs, caustic bass and biting venomous snarls. During late 2008, 1349 recorded its fourth album, Revelations of the Black Flame. Revelations of the Black Flame marked a change in direction for the band, as songs on the album were slower than previous releases, and there were also some dark ambient and industrial-tinged tracks. 1349 released its fifth album, Demonoir, on 26 April 2010. The album shows a return to 1349’s earlier sound, before Revelations, while continuing the low-fi production and ambient sensibilities. Their latest opus Massive Cauldron of Chaos is the pinnacle of their craft. The band are more than a hyper-blasting, scream fest. They often explore the slower, darker and more experimental side of black metal, while still retaining the spirit of total chaos. 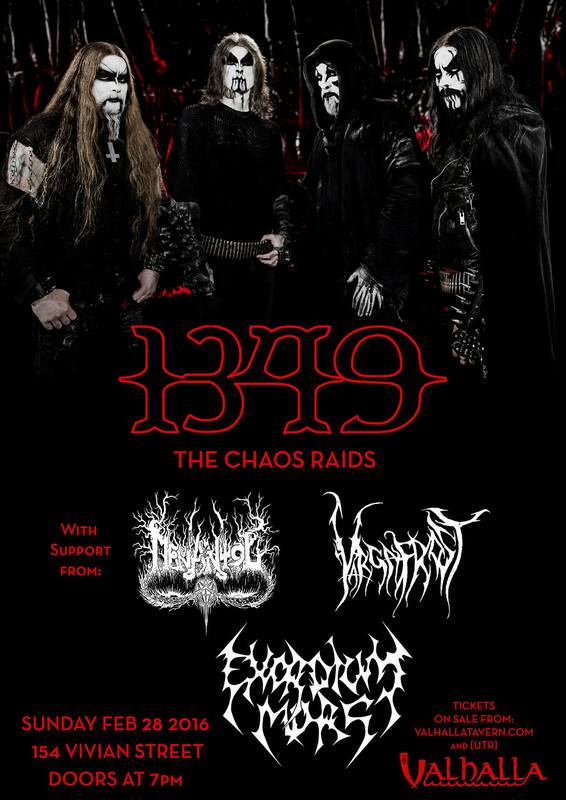 Capable of blending a deeper and more sinister darkness with extreme intensity and venomous aggression, 1349 are true innovative of the genre.